With its art deco facade, and a popcorn machine that erupts with Old Faithful-like regularity, the Highland Movie Theater is a fixture of St. Paul's Highland Park neighborhood. Built in 1939, generations of St. Paulites have gone to the Highland to see their movies. But that era may soon be passing. St. Paul, Minn. — Steppingstone Theatre for Youth Development in St. Paul has signed a $1.35 million purchase agreement to transform the Highland into its future home. After conducting a four year, exhaustive search with the assistance of a real estate broker, Artistic Director Richard Hitchler says Steppingstone settled on the Highland. "We've had looked at that particular space amongst 23 other spaces that we evaluated," he says. "And that one rose to the top of the criteria that we were looking for." Steppingstone Theatre for Youth Development is St. Paul's only childrens theater. It's unique in that it provides kids an opportunity to be in professionally produced and directed plays. Richard Hitchler says over the last several years, Steppingstone has experienced enormous growth. It's had to spread its programming throughout the city because there's not enough space in its current home in the basement of the Landmark Center. "We like this building but unfortunately there are certain things we can't do here," he says. "We can't do any of our classes in this space. We don't have a scene shop here. We don't have space to build costumes. We don't have enough seats right now where we are for the number of performances that we're doing." Moving into the Highland, says Hitchler, would allow Steppingstone to double capacity to 500 seats, and bring everything into one central location. Hitchler says most important is the increased visibility the move would provide. "Our identity has been sort of squashed by being in the basement of a facility with no visible means by which people can find us or know that...here we are!" he says. "I talked to a man who called to buy tickets who said, I've worked in downtown St. Paul for 20-years --- I had no idea you were there." Hitchler says Steppingstone would not be the only arts resident of the restored building. Other groups such as Theater Mu, Teatro del Pueblo and the Minnesota Jewish Theater have indicated interest in using the space. Usually, growing arts organizations looking to move are greeted warmly - even enthusiastically - by the neighborhoods they want to relocate to. But in Highland Park, there is reluctance - even resistance - to the prospective arrival of Steppingstone. Stephanie Shimp is co-owner of the Highland Grill across the street. "The Highland Theater of course is an institution," she says. "It's been here some fifty years and it was one of the main factors that drew us to this neighborhood." Shimp is happy an arts organization and not some other business wants to move there. Yet she doesn't think Steppingstone will be able to generate the same amount of continual business as the movie theater. "I say 'I'm right off the corner of Ford Parkway and Cleveland' and they scratch their heads and go 'ahhhhh?' Then I'll say 'Well do you know where the Highland Movie Theater is?' And they'll say, 'Well, yeah!' I'll say, 'I'm two doors away from there.' So that really works well." Even the people who work at Mr Movies, the video rental shop at the end of the block, want the Highland to stay. So do the customers. Leigh Crump has walked to many a movie at the Highland. "It's the end of an era if we have to go out to the suburbs to see a movie. I love these little theaters." When asked if he's like to see a children's theater in the space, Crump is blunt. "Not if I have to give up this theater." To date the Highland District Council, Highland Business Association and the Macalester-Groveland District Council have all passed resolutions in favor of retaining the movie theater. St. Paul City Council member Pat Harris, who represents the Highland Park neighborhood, says he's been flooded with calls, from kids to retirees. "You're hearing this amazing wide range of people," he says. "People that don't call City Hall that often, people everywhere that say the community has to rally around this place so we can keep it." Harris says he respects Steppingstone's legally binding purchase agreement with the Highland's parent company, Mann Theaters. But he and St. Paul Mayor Randy Kelly want the childrens theater to consider staying downtown, somewhere in the city's cultural corridor. Harris wishes Steppingstone would listen to the outcry from Highland businesses and residents. "I'm hoping they will see what the broader community is saying and just step back, so we can all examine where we're at with the arts in St. Paul," he says. One of the stronger voices supporting the Steppingstone purchase is Michael Mischke, publisher and editorial writer for the areas two community newspapers, the Highland Villager and the Grand Gazette. Mischke says single movie theaters like the Highland, and its sister theater in St. Paul, the Grandview, would never be built today. "You need increasingly 16, 18, 20 screens and a central commissary to serve the popcorn and the candy, which is where they're really making the money...it's not in the theater patrons," he says. 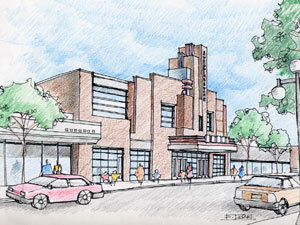 "I think it's inevitable that the Highland and Grandview theaters will one day go away." Mischke says the businesses worried about losing business with Steppingstone's arrival should know arts patrons probably spend more money elsewhere than movie-goers. And he says it's important to remember the proposal made a year or so ago, to raze the Highland and turn it into suburban style Walgreen's with parking in front. "Nobody would have liked to see that," he says. "And that's one of the reasons I believe the opposition to Steppingstone Theatre is misplaced because if a live performance theater a la Steppingstone isn't able to acquire the property, I think you'll end up with something like that and we'll lose the building. And the building itself has some historical value." Steppingstone has until the end of January to close on the deal. If it falls through, owner Steve Mann, President of Mann Theaters, says the Highland will remain a movie theater at least for the time being, because as he puts it, it's profitable. In addition to the movie theater's 1.35 million dollar purchase price, Steppingstone's Richard Hitchler says it will take approximately $2.5 million more for renovation. He says the capital campaign is proceeding as expected. He acknowledges it was a setback when the city turned down its request for a $300-thousand loan through St. Paul's sales tax revitalization program or STAR. Hitchler also admits to being taken aback by neighborhood resistance to the project, but he understands it. "Change is hard for people a lot of times. I think change is a difficult thing, but I think once people get to know who we are, they will very much embrace who we are and what we do."